While archaeologists are trained in a number of different skills and techniques, there is one thing that all archaeologists know and love: shovels. Shovels are just as much a part of archaeology as the ubiquitous trowel, and even lend their name to the title of hard working archaeologists who dig for their supper, shovel bums. Every archaeologist can recognize many types of shovels, and we all know what situations they are best for during excavation. So, it is always fun when we get to use a shovel to dig one up. During CAP’s 2017 field school at Station Terrace, just such an event occurred. 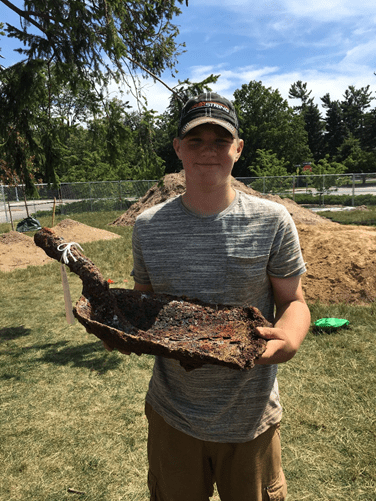 In Unit F, placed within the interior of the building, a large shovel blade was recovered by students (Bright 2017). At about 14 inches wide, 17 inches long, and 4.5 inches deep (give or take a quarter of an inch or so of rust), this was a large metal shovel that, based on its deep well, was designed for scooping (McLeod n.d.). Due to its scoop appearance, this shovel may have been a large-scale mover of things, such as coal, grain, gravel, mulch, etc. But this begs the question: why was this type of shovel in Station Terrace? Station Terrace, which stood on campus from the early 1890’s until 1924, served many functions during its relatively short life as part of MSU. 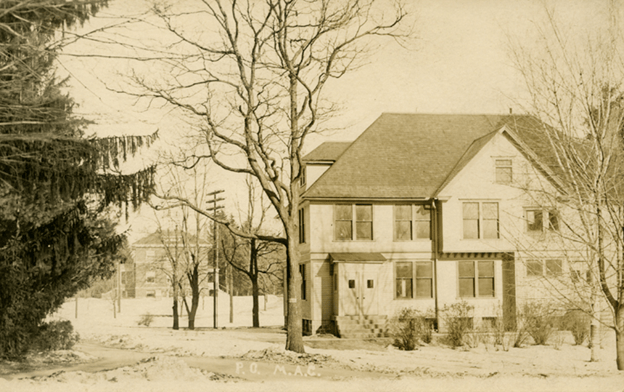 Early on, it was used as housing for visiting researchers and then for unmarried male instructors, during which it received the great nickname of “the Bull Pen.” From 1903 to 1923, Station Terrace was used as the East Lansing Post Office, while a front room served as a trolley car waiting room. In 1921, the waiting room was turned into a small café, known as the Flower Pot Tea Room (Bright 2016; Michael 2017). Thanks to a house fire in 1903, exterior photographs and the one existing photograph of one of the bedrooms, we know that the building had at least one chimney pre-1910 and two post 1910 expansion(Bright 2016); indicating it had fire places and possibly some other source of internal heating, but there is no mention of a large coal-burning stove that would have required a large shovel for moving coal. It also does not appear that any of the buildings many functions would have required the movement of large amounts of scoop-able materials, unless the post office moved letters and packages by shovel. 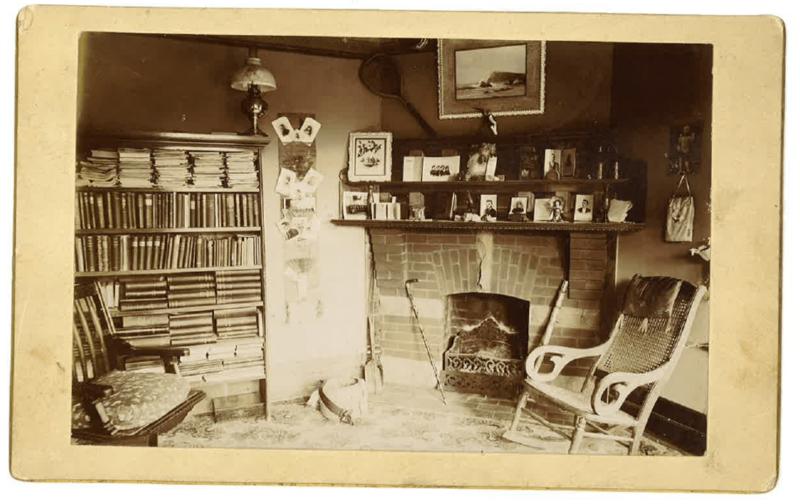 Photo of the room of F.B. Mumford c. 1894. Image courtesy of MSU Archives & Historical Collections. So why was this shovel kept in Station Terrace? To me, the mystery of how objects were used in the past can be just as much fun as uncovering tidbits of history that have been lost for thousands of years. Humans are an amazingly creative bunch, meaning that we use objects in many different ways. For example, my wife uses a high-ball glass not for drinking, but for cutting dough to make pierogis. We rarely use this glass for anything else at home; it is reserved for a purpose that many people would not expect. I think the Station Terrace shovel was used in a similar manner. While it may have at one point served to shovel coal, grain, or other materials, I think it was used as a snow shovel at Station Terrace. Being located in Michigan, MSU gets a lot of snow. As Station Terrace served as a post office and trolley stop, moving vehicles, people, and mail carts would have regularly needed access to the building. Snow and ice would have impeded this accessibility, so snow removal was, and still is, essential. As this blog by Tim Heffernan attests, old coal shovels make great snow removal devices thanks to their weight and their metal blades. In the end, it is very difficult to know exactly how this object was used, but context clues suggest that it might have completed a number of jobs in its life, some that are easier to imagine, others that will continue to be a mystery. 2016 “Station Terrace: A Building with Many Identities.” Campus Archaeology Blog. http://campusarch.msu.edu/?p=4255. 2017 “2017 Field School Recap: Station Terrace.” Campus Archaeology Blog. http://campusarch.msu.edu/?p=5401. n.d. “Types of Shovels: Your Complete Guide to What Works Best Where.” https://www.backyardboss.net/types-of-shovels/. 2017 “The Flower Pot Tea Room: A Female-Run Student Business on the Early Campus.” Campus Archaeology Blog. http://campusarch.msu.edu/?p=4895.